At Hermann Design Group, we are committed to the new WOW factor – creating aesthetically pleasing landscape design that strategically reduces water consumption. 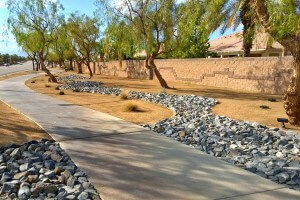 The current water shortage makes drought tolerant landscaping a priority, and this style of landscaping should be considered in our desert area where surplus water will always be scarce. However, this xeriscape style can still include lush plants and interesting focal points creating an inviting outdoor environment. Using native plant species and creative irrigation systems, we pride ourselves on drought tolerant landscaping solutions that save water and money, while still providing unique and inviting outdoor environments. Reducing turf and the excessive irrigation needed to maintain its growth can save significant amounts of water, which translates into substantial savings and can help to avoid water district penalties. In addition, there are a variety of local government incentives to reduce your turf and transform your outdoor living space to drought tolerant landscaping. At Hermann Design Group, we work closely with you to facilitate and manage the benefits of these incentives by developing appropriate designs for pre-approval to ensure eligibility for these programs. Starting from a bare, open lot to renovation and rehabilitation of existing landscaping, our designs are more than just turf removal or reduction. We consider your space carefully to strategically incorporate hardscapes such as patios, pathways, decorative retaining walls, and other features to reduce plantings yet still retain style and beauty. Unique focal points including decorative boulders, colored stone beds, fire pits or features, and outdoor sculpture add visual interest and contrast. 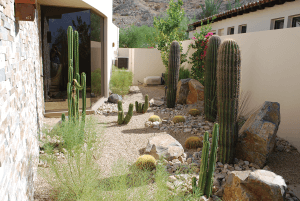 Drought tolerant landscaping can still be lush using native grasses, flowering groundcover and shrubs, and a variety of palms and desert trees. Clusters of plantings can create a “desert cottage” style. Or for a more modern design, we focus on clean, contemporary lines of various cacti and other succulents with contrasting colored rock beds. Featuring colorful or unique pots and planters can also add style while using only water-conscious drip irrigation. Incorporating accents, colors and interesting focal points, Hermann Design Group will create a drought tolerant landscaping plan that maintains the style of your home or structure, balancing sustainability, creativity, and always working on time and within your budget.